Storms can cause horrific damage to your home and property. Call us if your home has been damaged from fallen trees, heavy winds or a flood. We will do an inspection of the property, clean up the debris, dispose of the trash, sanitize the materials and repair the damage. We provide water extraction and drying in case of any leaks or floods through the home or business. It is important to have the space dried right away to prevent mold growth. We can also examine the building to ensure it has retained its integrity. Call SERVPRO of Georgetown / East Round Rock / Hutto 512-301-7765 for any storm serge, mold growth, fire restoration or bio hazard clean up you may have in your home or business. We are committed to giving the best service for commercial and residential storm damage cleanup. We hand all aspects of cleaning up from the initial inspection, disposal of debris, storage for belongings to the repairs of your home or business. It is essential to have the building inspected, cleaned up and dried out after a storm for safety reasons. The damage that maybe be missed during an inspection can become severe and more expensive to repair and replace. We pride our services of being available 24 hours a day, seven days a week for any type of storm, water, fire or bio hazard clean up you may encounter. Make sure everyone is accounted for in your home or business. If water is entering a building, move to an upper floor if possible. Do not light any fires, in case of gas you cannot see. Do not touch anything electric if you are standing in water. Avoid the floodwaters. The water could be contaminated with oil, gas or raw sewage. It could also be electrically charged. Always remember when driving, do not cross roads with high running waters. Turn around don't drown. A slow water leak over a long period of time created a large area of mold on the inside of the wall unseen. The water leak was discovered because the homeowner found a spot of discoloration on the sheet rock in the hallway. SERVPRO of Georgetown / East Round Rock / Hutto went to the home thinking they were going to dry out the powder room bathroom that had a toilet overflow. When they removed part of the drywall they found the mold pictured. 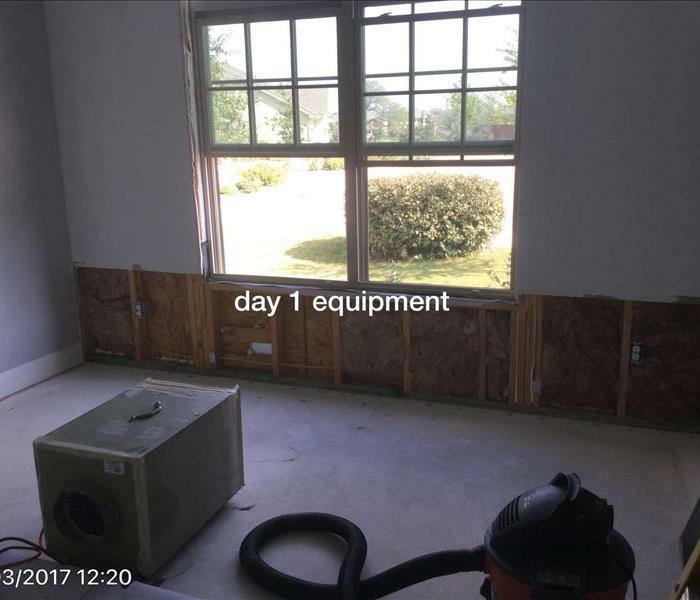 Our technicians removed the area of mold and treated the walls with antimicrobial solution to kill all of the mold spores. The customer was ecstatically happy that we were able to eliminate the danger. Call SERVPRO of Georgetown / East Round Rock / Hutto 512-301-7765 for any mold remediation projects. SERVPRO of Georgetown / East Round Rock / Hutto can come to your home and test for moisture and mold with a Home Moisture Inspection. Our equipment allows us to determine the level of surface moisture or contamination of mold possibly impacted by a Category 1, 2 or 3 water. The use of the meter allows water loss respondents and restoration professionals real-time ability to identify the level of water loss upon the building materials. This also helps up provide quality assurance to the remediation process. The detection system can be used to generally quantify the total bacterial concentrations of a Category 1, 2 or 3 water as described by the IICRC Standard and Reference Guide. Call us if you think you need a Moisture Inspection done for dampness in your home 512-301-7765. 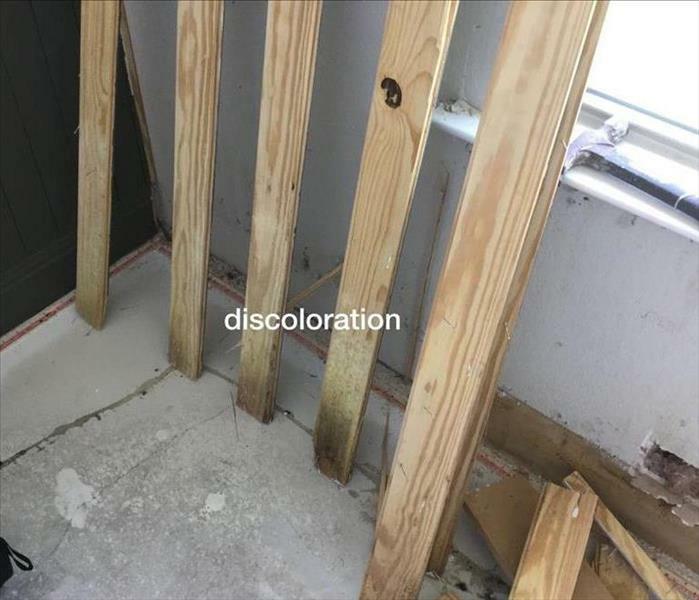 An older home in the Round Rock, Texas area discovered a leak in the kitchen that was seeping through the wall into the living room underneath the wood flooring. The picture shows how the mold started to grow from the wall down the wood planks. Our trained professionals were able to remove the mold and spray the area with Sporicidin Disinfectant. This chemical is a pesticide product that is registered by the Environmental Protection Agency. We make sure to contain any areas that we may have to spray the disinfectant in. Safety for our customers and employees always comes first! We are extremely careful when handling and spraying in your home or business. Call SERVPRO of Georgetown / East Round Rock / Hutto for any mold remediation 512-301-7765! A local gas company found a gas leak underground and evacuated over 600 people from their homes and businesses. The restaurant employees were told to grab their personal belongings and walk out the door. All of the food they were prepping for the day was left on the prep tables and the fryers turned off. Everything was shut down. After 3 weeks with no electricity and no entry into any building, you can only imagine what they found. The odor was foul and the food left out was moldy and rotten. The freezers were full of food and now all defrosted. SERVPRO of Georgetown / East Round Rock / Hutto took special care of the restaurant owner and the kitchen to make sure they would pass inspection to open back up. After a fire there can be a lot of debris to pick up and also an abundance of restoration to be done on anything that survived. At SERVPRO of Georgetown / East Round Rock / Hutto our crews are trained on how to properly handle the debris left behind from the fire department putting out the fire. Our technicians are skilled at wiping down surfaces that have been affected by the soot. Yes, there is a special way to do it so that it does not smear. There are also special chemicals that we have to help with removal of the odor too. Call us 512-301-7765 for all of your fire restoration, mold remediation, water mitigation and bio hazard clean up 24 hours a day, 7 days a week. Water can leave a very unpleasant path when it travels through your furnished home. It can soak up into anything that is not metal or plastic. That means furniture, walls, flooring and cabinetry. 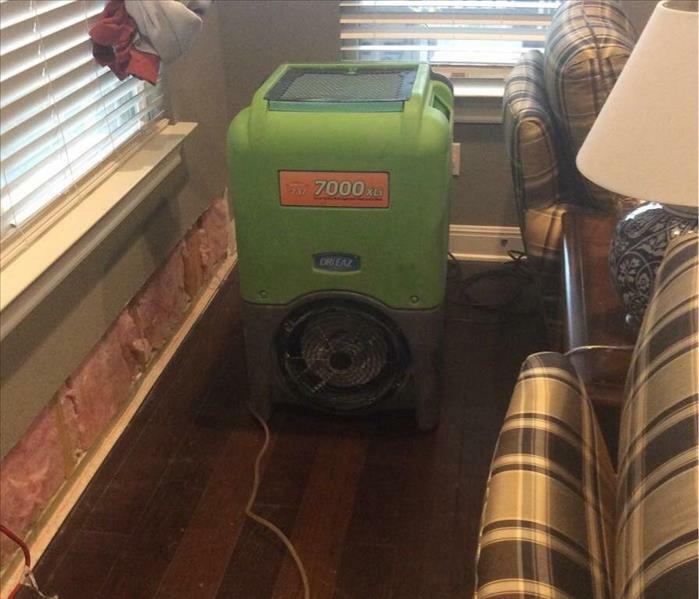 SERVPRO of Georgetown / East Round Rock / Hutto can help you to remove the water and dry out the house. Our water remediation process starts with extracting any standing water and making sure the furniture is up off of any wet surfaces. Carpet and padding have to be removed in order for the room to completely dry. If the water around the cabinets didn't penetrate to the walls we can set up fans to dry it out. Sometimes we do have to remove them to make sure no mold can grow behind them.